Tuesday night is brewery night at The Hopyard in San Ramon and nearly every Tuesday you can find me there. I enjoy good beer (as many of you know) and the bonus of going to brewery night (what I typically call pint night) is that I can get custom pub glasses and specially-priced refills of the featured brewery. As The Hopyard puts their calendar out I update my calendar with who the featured brewery is so I can know in advance if I'm taking the family out for dinner there. Years ago Cato's Ale House on Piedmont Ave in Oakland (where my pint glass collection began) was my destination to get my fix of good brew and pub food. I live closer to The Hopyard so that's where we tend to go most (Buffalo Bill's Brewery on B Street in Hayward is my other local spot). For those of you who have never been over to my place, nearly 100% of my glasses are pint glasses. Most of them I pick up at various pint nights and when I travel on business I try and pick up a new one (or four) from a local spot (as long as the glasses are cool). Some of them I put on a shelf and don't drink out of (Don't touch it, No, Don't even look at it). Much to my wife's dismay I take home pint glasses from pint night, buy pint glasses when I'm out and about and even get pint glasses as gifts. Last Tuesday the featured brewery was to be Hennepin. I've heard of most breweries, but with many craft breweries entering the marketplace every now and again I'm stumped. The Hopyard typically features NorCal breweries (my favorites), but every now and again their have something from elsewhere. 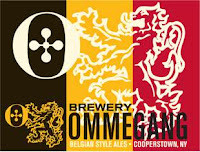 I did some searching on the net and came up with Brewery Ommegang (website here) a Cooperstown, NY brewing company specializing in Belgian-style ales. Since Belgian-style ales are favorites of mine and since I always like trying brews from around the country (and the globe) I was looking forward to Tuesdays taste. Much to my chagrin something happened and they switched up to Sam Adams at the last minute. Don't get me wrong, I have nothing against Sam Adams (I was a fan of the Samuel Adams Imperial IPA) and I've even visited their R & D brewery in Boston, but I was expecting a Belgian so it was a bit of a let down. 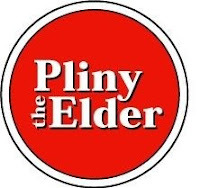 Since I didn't feel like a Summer Ale I decided to enjoy a Russian River Pliny the Elder, an 8.0%ABV Double IPA. Some people think Pliny is overrated, but I enjoy the smells of citrus and tropical fruits, hints of pine and caramel sweet malt. The finish is extremely clean. While I was at The Hopyard I picked up a copy of The Northwest Brewing News (check out their site here and get a subscription - if beer is your thing). 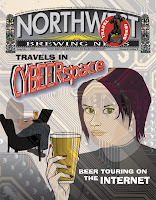 I enjoy reading about "beer news" and found that they were looking for a writer...a Bay Area correspondent...so I read out loud to my wife the ad..."NWBN is seeking an energized individual to report of the good beer spots in NoCal. Must be a talented writer and beer knowledgeable. Must have Word software. Must be able to meet deadlines. Digital camera and high-speed Internet access a plus." Seeing as I was able to "check" each of these categories my wife encouraged me to send an email to apply. I'm a home brewer. I've toured most of the breweries in NorCal, plus, when I travel on business I try and hit up any and all breweries and brew pubs wherever I land. Seems like a fit. So, I plan on forwarding the URL to my blog to these kind folks to see if they'd have any interest in having me do some reporting for them.